I don’t believe I had originally categorized my Easy Breakfast Casserole as a High Five Recipe. But as I put the recipe together one night, preparing to bake it the next morning, it occurred to me that the way I typically make this for my family – it has just four simple ingredients. I love how easy this is to make: Eggs, cream, bacon, and cheese – that’s it. You can add more to it (it’s great with peppers!! ), but our boys like it best when it’s made with very basic ingredients. Every time I’ve fed this to guests, it’s been a hit. And it could not get any easier to put together! I like mixing it up the night before, then getting up and putting it in the oven to bake while I get dressed and ready for the day. 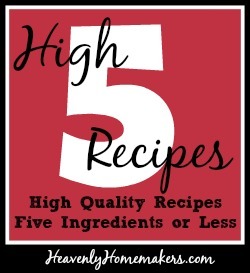 Quality recipes, five ingredients or less. Does healthy cooking get any easier? I do do this with ham. Great for when we have company and I want to make breakfast. It’s always a hit! I just mixed this up for dinner! Then I checked my Google reader & saw you had re-posted it. Tonight, we added chopped yellow & orange bell peppers, grape tomatoes, cheddar, & ground sausage. We call it crustless quiche, and add broccolii, carrots and co-jack or swiss cheese. Going to try it plain and see the results. I do agree the kids tend to prefer simple ingredients and closest to whole as possible. I love this idea. If you want to get all crazy with it you could add sauteed onions and garlic, cayenne pepper, and spinach. Well you could basically add anything breakfast-y and it would be fabulous. My husband’s a savory breakfast guy, so I think I’ll whip it up tonight for tomorrow’s breakfast before church! I’ve used your recipe so much – it’s even easier than scrambled eggs. Thank you! I have a new baby, so I like to mix it up at night (in about 4 minutes) and bake in the morning. Last time I put a whole bunch of garlic chives from the garden in it along with ham. It looked beautiful and was so flavorful. This is very similar to a favorite of our family as well. Please know that it also works to make it with unsweetened almond milk and dairy-free cheese, and custom made for those of us with milk intolerance’s! And our favorite potatoes to use? Tater tots! Maybe not the healthiest choice, but oh, so yummy! I cannot wait to try this! It is so versatile with the ability to add so many various ingredients. Will be especially helpful when company comes. I love this egg casserole. I’m so glad you came up with it. 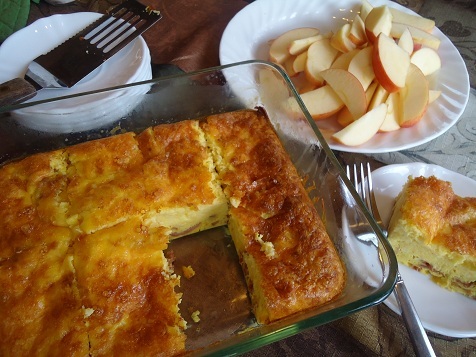 I don’t like egg casseroles that have bread in them….so this is perfect. I usually make it once a week and eat it during the week. Ham is great in it! Thanks so much for the recipe. Our girls like simple and onions are NOT in the equation. LOL So I often use granulated organic onion and garlic that I get in bulk from my food coop. They don’t mind cheese and ham. Going to make it with turkey ham, cheese, and tomatoes. Yumm. My mouth is watering.